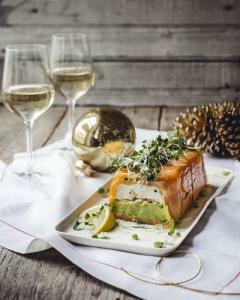 Last year we shared traditional British dishes paired with Bordeaux wines, this year we are going to inspire you to add a bit of Francais to your Christmas table with these delicious recipes. 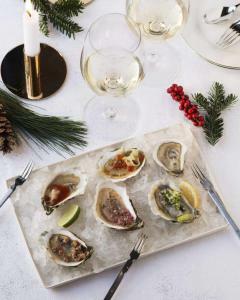 Nothing says simplicity like oysters. You’ll love the ease of this recipe as it demands so little of your time, freeing you to dedicate more precious minutes to the main event. For an authentic touch, serve your oysters on their half shells along with a selection of lemon, Tabasco sauce and mignonette (shallot vinaigrette). Your guests will love the choice of toppings. Of course, Christmas wouldn’t be Christmas without salmon. Smoked salmon works beautifully after a course of oysters, and it’s a sublime all-round starter for those who weren’t quite adventurous enough to try a delicious mollusc. The fun really begins when you smoke your own salmon. Nothing says festivities like smoking a fillet of fish before the big day! Resist the temptation to grab the ready-made off-the-shelf stuff — instead opt for the freshest fillet of salmon you can lay your hands on. The best method is to cure it in brine for two days, and then add your own touch by infusing the salmon with herbs, like dill. For a purple infusion try adding some beetroot. A classic to accompany smoked salmon is a dry white from the Pessac-Léognan region of Bordeaux, such as Château de Cruzeau. You’ll sense notes of citrus peel, spice and vanilla in this wine, the perfect festive white. 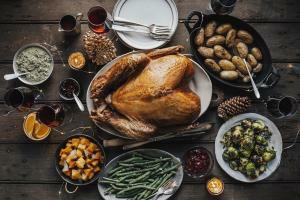 People often think of serving dry white wine with turkey, but with all the additional trimmings a Merlot based wine would go perfectly. Merlot is the most widely grown red grape variety in Bordeaux, and many delicious wines are produced. Why not try Dourthe Montagne Saint-Emilion Résergne. Save which will complement the rich flavours of your gravy, pigs in blankets and chestnut stuffing. With a spicy fruit nose and notes of chocolate you’ll find it also goes rather well with roast turkey. Then simply mix with the onion and mushroom mixture and stuff in the neck of your turkey. Ooh la la! In France, they have cheese before dessert — it’s tradition. But when you think about it, it makes absolute sense as it enables you to enjoy your lovely red wines for longer. For the most authentic of French cheese boards, you need Roquefort, Brie, Camembert and Mimolette. The blend of hard and soft cheeses will provide mouthwatering textures, perfectly complemented with a bottle of classic, perfectly-balanced Château Lauriol Francs CÔtes de Bordeaux – with its lovely fruit, plum and spice with some tobacco-scented development. 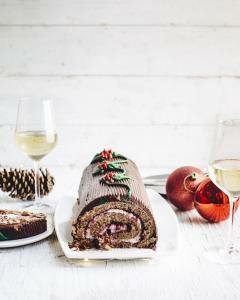 No French Christmas would be complete without a Buche de Noel, more commonly known in the UK as a yule log. Again, try to resist the urge to buy the ready-made product and instead unleash your inner baker. Whisk caster sugar and egg yolks in a bowl until pale and thick. Take some chocolate and mix with a splash of cold water, rest this in a bowl over a pan of boiling water, then stir in the sugar mix. Whisk your egg whites into stiff peaks. The fun part begins as you fold the mixture into the chocolate, before pouring the mix into a tin and baking for just under 15 minutes. Leave it to cool in the tin. Once cold, spread with whipped cream and scatter with some festive berries. Then roll it up and voila! You have your very own Buche de Noel. Sit back and admire your handy work with a glass of dry white La Reine Collection Château Talmont. Its citrusy tones are light and go hand in hand with a freshly baked cream and berry Buche de Noel. Good luck with all your Christmas cooking adventures. 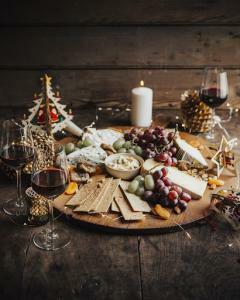 Joyeux Noël from everyone here at Bordeaux Wines.